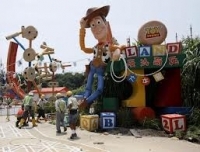 Hong Kong Disneyland has for the first time made a profit since it was started in 2005. The addition of Toy Story Land helped Disneyland unit to turn a profit last year for the first time. A little help from Toy Story and Grizzly Gulch did the trick. The theme park, which opened in 2005 amid hopes of cashing in on the rising middle-class in mainland China, netted earnings of $14.1 million, reversing a loss of $30.6 million in the prior 12-month period. Revenue jumped 18% to $550.7 million as attendance rose 13% from the prior year to a record 6.7 million visitors. What has also helped is the local features for toys displayed. There was a 13% increase in the number of tourists from mainland China, who make up close to half the total. The 320-acre park on the Lantau Island is modeled on the original Disneyland in Anaheim, but is only about a third of its size. Park officials are hoping to keep up the growth momentum with "Mystic Point," which is set in a rain forest. The park, owned by the Hong Kong government and Walt Disney Co. in 52-48 ratio, may need to ramp up more as competition heats up for mainland Chinese dollars. One potential Mainland rival is Shanghai Disneyland which is scheduled to open in 2015.